LAURIE & WHITTLE. 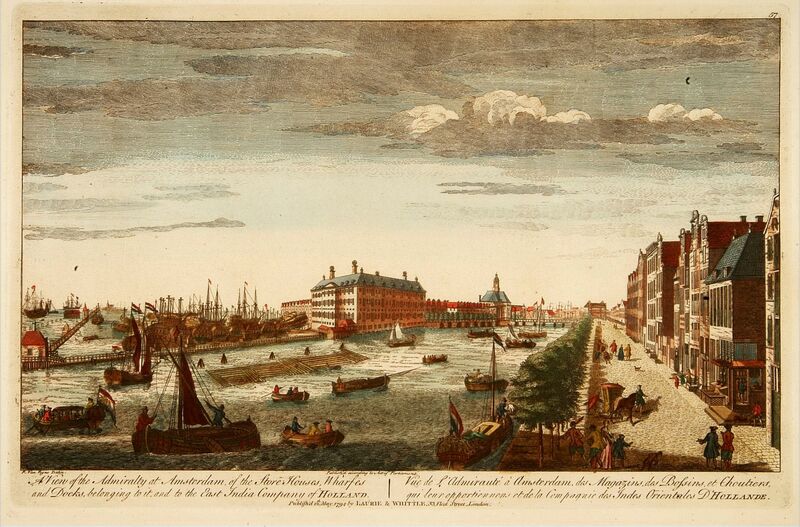 - A view of the Admiralty at Amsterdam of the store houses, wharfes.. To the East India Company of Holland. . .
A view of the Admiralty at Amsterdam of the store houses, wharfes.. To the East India Company of Holland. . . - LAURIE & WHITTLE. Title : A view of the Admiralty at Amsterdam of the store houses, wharfes.. To the East India Company of Holland. . ..
Map maker : LAURIE & WHITTLE.. Size : 9.8 x 15.3 inches. / 25.0 x 38.8 cm. Description :Decorative view of the headquarters of the V.O.C. (present-day Maritieme Museum) and their wharfes and docks, with extensive shipping. After a design by Peter van Rijne.